As much as I’ve loved having Grimwald in the strip over the past couple months, it’s time for him to move on. But Grimwald will return someday, mark my words! jefbot made that promise to him, after all. Ooooh he’s going to be a fierce opponent one day! heh. true that, flame_fingers – and since Grimwald probably has a lot of time to himself (apologies to Sir Cottonbottom) in that cave, i’ll bet he’ll be a MtG Master (as well as a Tetris master!) by the time jefbot sees him again. true that, theBean. i still have my Magic cards from like, twenty years ago. …wow, has it really been that long? Awesome as usual good sir. thanks for the “awesome” comment, Onlyones! ooh, yeah – Grimwald better get back and seal off all those hatches, Maryz! I swear, this story needs to be turned into some sort of television show or something. 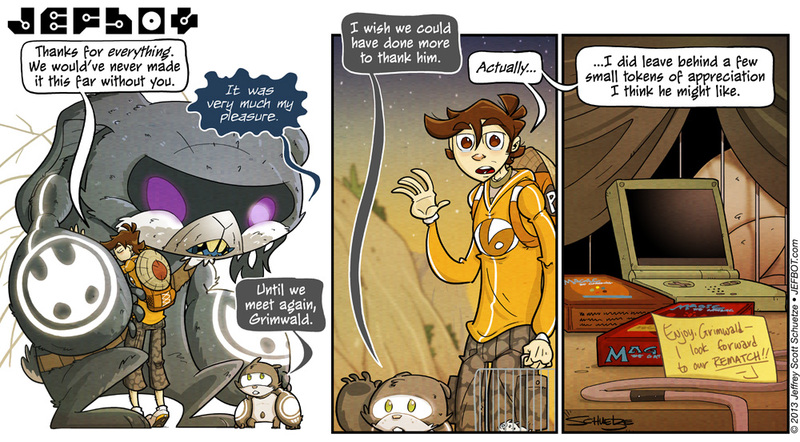 Let’s hope that Grimwald finds some new buddies to play Magic with. It must be awfully lonely in that cave. and, agreed: let’s hope Grimwald finds a buddy. maybe he needs to “evolve” Sir Cottonbottom? Wow got busy so missed the shades again. I do know how Jefbot feels leaving Grimwald. I love the fact that he gives him a hug and leaves his own treasure for him. Now those are the kind of gifts I would leave a huge, intimidating, yet intelligent beast. Well played. On an unrelated note bot, you’ve been popping up on my friends list on my 3DS a lot lately, playing the new Zelda. I’ve been playing that too. How are you liking it so far? glad you approve, Striker! let’s hope Grimwald takes losing well, if it comes to that. “let the wookie win” comes to mind. and while i haven’t been able to play the new Zelda as much as i’d like, i do LOVE what i’ve played so far! one of my favorite Zeldas in a loooong time. i especially love how fast they throw you into the action/story. what do you think of it? I’ll say this, it’s managed to make me put Pokemon X off to the side for a while. Link to the Past is my all-time favorite Zelda game, and it’s cool to be traipsing around that world again. I’ve played quite a bit, both advancing the story and just looking for secrets. I could probably write a small essay with all that I like about it. All in all, it’s an awesome game. playing A Link Between Worlds has totally made me want to revisit A Link to the Past, Striker! i wish they would offer that on the 3DS actually. amazing how well those top-down zeldas work. i’ve been playing a little Wind Waker HD and – while i still love the game – the mechanics just work so much better in a top-down environment. anyway, agreed: ALBW is an awesome game. Aww, bye giant cave bunny thing. We’ll miss you. Who is Grimwald going to play Magic with in the meantime? Perhaps there is a nearby giant cave chipmunk nearby he could teach it to. i’ll miss Grimwald too, Shanna! i already want to write some side stories detailing his life in the Hollywood Hills. I’m sure Grimwald can find an online partner . . . Or create his own. I’m sorry, but I wouldn’t have been able to leave the Gameboy Advanced SP there. I’m to much of a nerd to let it go. Oooo, nothing says “thanks” like board games and Game boy. and, hey – i’m digging your christmas-y avatar! maybe someday those stories will be told, HITD. I’m guessing Bot is the one wanting the rematch? Well let’s hope that Bot gets the chance. True, because I doubt many people would be in a position to deny a giant rabbit a rematch. d’aww…I love Mu’s expressions on the first two panels…for a character with no eyebrows, he emotes incredibly well. …also, the obligatory hilarious mental image of Grimmy hunched over that teeny-tiny Game Boy (by the way, where exactly did ‘bot leave those farewell presents? First guess is the cave…which got blow’d up, so I hope Grimmy took them to an auxiliary control room before leading them to the Tunnels of Epic Posing). and, yes – the mental image of Grimmy manipulating those tiny controls with his big ol’ paws makes me smile. heheh. as for where bot left the gifts – they’re in the cave, right in front of Sir Cottonbottom’s cage, since bot knew that would be an area Grimwald would be checking out fairly soon. Oh. Duh. Now that you point that out, it’s blindingly obvious…would you believe yesterday was just surprisingly long for me? sometimes long days are good, JOE! (although some can be very bad.) i feel like my days have been way too short, lately.